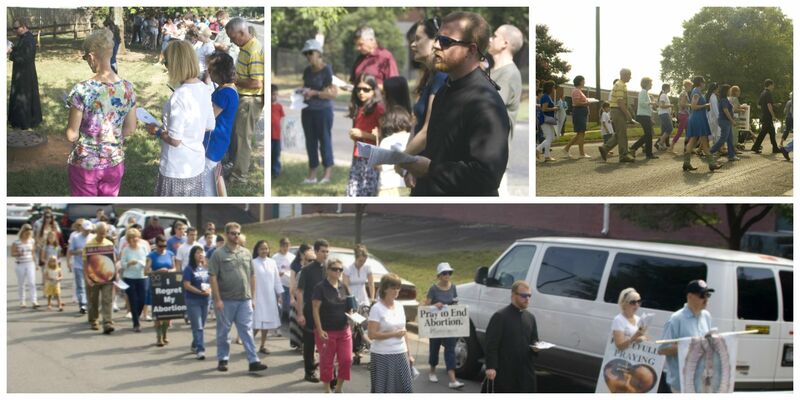 After Mass, Father Mark Lawlor, pastor, exposed the Blessed Sacrament in the chapel for a Respect Life Holy Hour, while Father Coleman and seminarian Peter Ascik led more than four dozen faithful to the Family Reproductive Health abortion mill on East Hebron Street to recite the rosary and pray for an end to abortion. Wonderful spiritual leaders leading their flock. Over 50 people joined us in prayer on the sidewalk, not including those who stayed behind to pray with us in Eucharistic Adoration in the chapel. NEXT PROCESSION FOR LIFE IS OCTOBER: October 3rd, 2015 at St. Basil’s Ukranian-Greek Catholic Mission led by Fr. Mark Shuey (meets in the chapel at St. Thomas Aquinas parish). Divine Liturgy begins at 9:30am, with a Procession start time of 11am. See you there!